Registration for EUROPHRAS 2017 is now open. To register, please complete the registration form. Please note that places will be allocated on a first come first serve basis and once the conference venue reaches capacity, the online registration portal will close with no further registrations being accepted. Registration prices will increase starting Tuesday, 5 September, 2017 once early online registration has ended. After the November 9th deadline for late online registration, you can only register on-site at the conference venue starting 13 November, 2017. The conference fee includes the main conference sessions and poster sessions. Workshops are not included. The fee includes: entrance to the conference sessions and conference materials. Conference proceedings are included in the fee (a hard copy of the accepted regular papers, to be published in a Springer LNAI volume, and e-proceedings with ISBN and DOI ID of short and regular papers). These will be available at the time of the conference. Authors presenting multiple papers are requested to pay the full fee for the first paper and half the fee for each additional paper. Registered attendees cancelling their registration one month or more prior to the conference will be refunded the full amount paid. 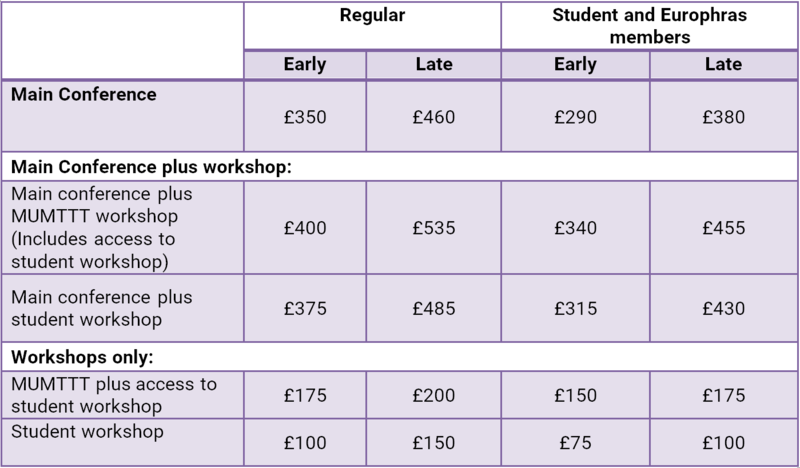 Registered attendees cancelling up to three weeks prior to the conference will be refunded any amounts paid over and above the first £200. Registered attendees cancelling within three weeks prior to the conference and all no-shows will not be refunded any amount. Registered attendees cancelling due to governmental travel restrictions, failure to obtain a visa, or serious illness that prevents travel to the conference will be refunded the full amount paid regardless of when notification and proof is received by the EUROPHRAS 2017 office. Please note the Cancellation Policy above only applies to registrations of attendees who do NOT have their contributions included in proceedings. Cancellation and refunds are not possible for authors who have had their papers accepted in the proceedings.